Can’t decide if I would find it funny when I walked into the suite or just fun Either way, it makes a great story! 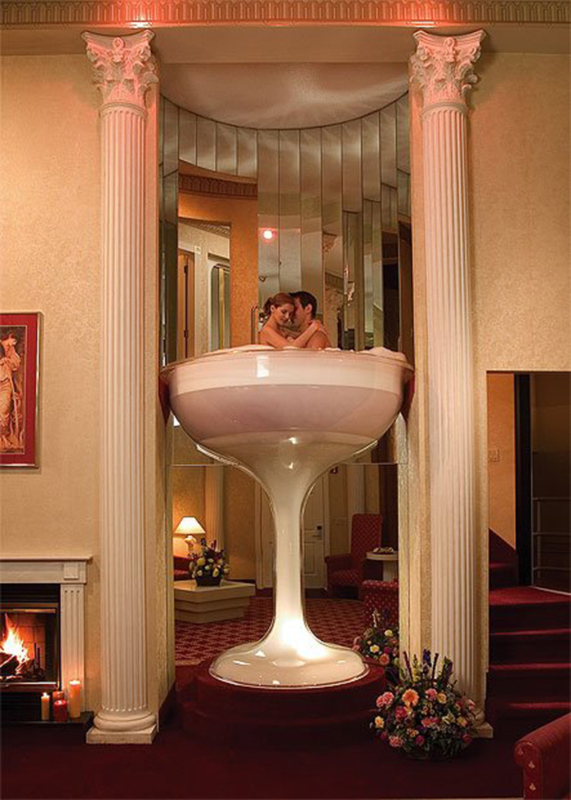 How many people can say they had a champagne glass hot tub for their romantic getaway? In Niagara Falls Hotels, E-lodge Niagara is one of the best motel of the Niagara Falls which offers best quality accommodation for great vacations experience.15 Minutes’ walk to the Falls. It is centrally located among the best Niagara Falls hotels and motels and that easily accessible from Toronoto. We are close to the attraction but far from the noise. Interesting! I absolutely love the concept but I think the surrounding decor should definitely be updated. Would be funny to see the release that needs to be signed before enjoying a night in that particular room! Wet feet and ladder/stairs aren’t always the best of ideas… Nevertheless, quite original! Next Next post: Dutch Queen Beatrix turns 74!